Huge congrats to our client, Two Dudes Painting Company, for earning their B Corp Certification! A Lancaster County painting contractor received global recognition this week for using its for-profit business to make a positive social impact on its community. Two Dudes Painting is now a certified B Corporation. It is a certification given by nonprofit organization B Lab to recognize companies around the world for using business to solve social and environmental problems. Two Dudes started the application process about six months ago, which included going through rigorous analysis of its policies and procedures, according to Peter Barber, founder and owner of Two Dudes. Not only did the company have to inform B Lab that it offers health insurance to all of its employees, it also had to provide to B Lab its employee census showing the percentage of employees actually enrolled in health insurance, as well as the percentage Two Dudes is paying towards that insurance, Barber said. Barber said B Corp certification is rare in the construction industry. Most people don’t think of construction when they think of B Corp companies. More common are businesses in consumer products, such as food and cosmetics. 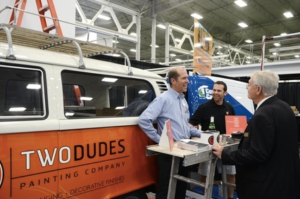 Although B Lab recognizes businesses in about 130 different industries, Two Dudes is the fi­rst painting contractor to earn the certification, a news release said. B Lab’s website lists only nine other construction companies, mostly builders, as certified B Corps. Two Dudes sought B Corp certification to show that any industry can make a positive social and environmental impact. For example, the company supports fundraisers in Lancaster to fight racism and violence against women, to name a few. It has also helped to preserve historic buildings in the city and has undertaken numerous public mural projects, a news release said. Founded nearly 30 years ago, Two Dudes employs 40 people at a 13,000-square-foot headquarters on Poplar Street in downtown Lancaster. The Stroopie Co., which is a cookie bakery in Lancaster that employs refugees, and graphic design firm Modo Design Group in Lancaster City, are the only other B Corp companies in the county. There are 56 in Pennsylvania overall. There are a little more than 1,800 B Corps worldwide.